Tiffany is from Envy's Lace Front Collection and is a gorgeous short style with smooth layers and wispy bangs. Fluff it up for a different look or brush it smooth for a sleeker look. 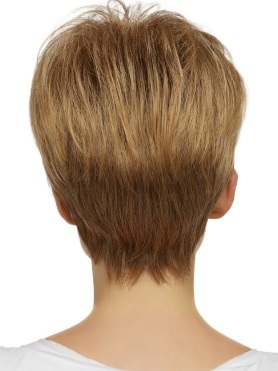 This version has a full monofilament top for a natural looking scalp and parting options. Tthe cap is a stretch open cap which adds comfort and breathability. Bangs: 3.25" Crown: 3.25" Sides: 2.25" Nape 2"